Pack and Pray takes place at 7:30pm on Thursday evenings and is a time to meet at “the CRU House” (36 Bartlett Street) and pray for the meeting that evening (Large Group) as well as pack the cars to transport our equipment to Milledoler for Large Group. The power of prayer is paramount in our faith and we believe our God works mightily when His people pray. This is why we set aside this very important time to weekly come before the Lord in prayer as a community and intercede on behalf of our campus. If you (member or not) need prayer for anything large or small please submit a prayer request here and we will come alongside you at our weekly prayer meeting. Feel free to include your name or remain anonymous. If you wish to remain anonymous simply put your name as “prayer request” in the linked form. 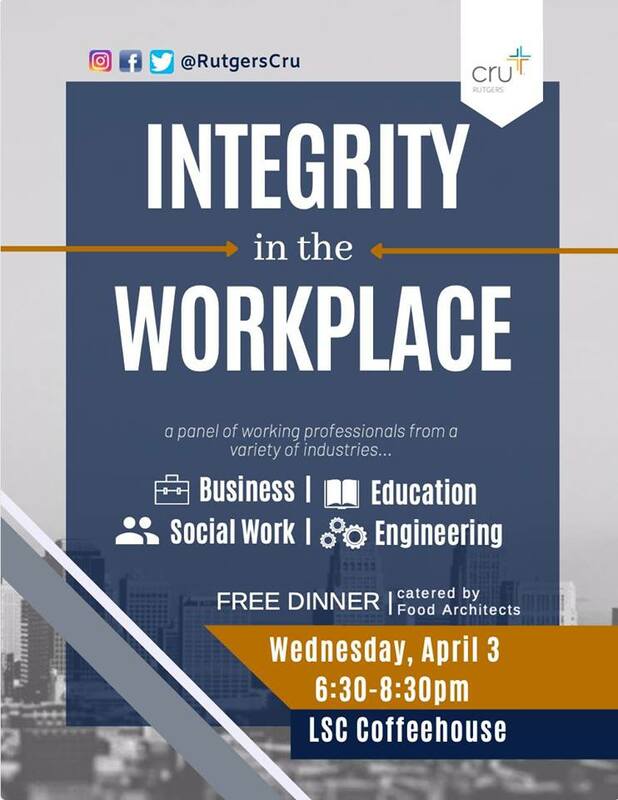 Integrity In the Workplace Event This Week! Join us for an event where students will have the opportunity to ask professionals from different fields questions about how their personal values influence their experiences in the workplace! Fields represented include finance, social work, education, and engineering! FREE catered dinner will be provided, as well as the opportunity to network after the panel discussion. Bored of your own Music? Follow members of Rutgers CRU’s playlists on Spotify for some new tunes!